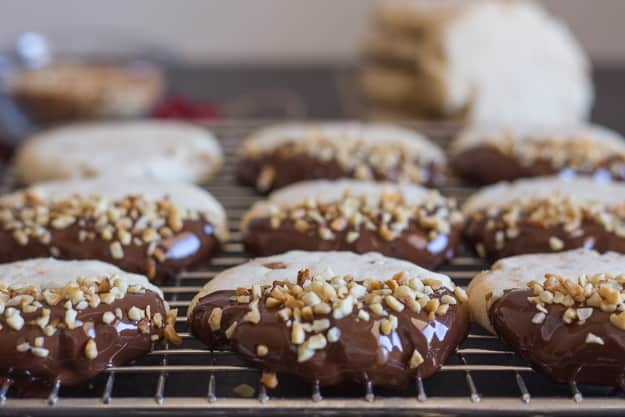 Chocolate Hazelnut Shortbread Cookies, a delicious melt in your mouth shortbread, the perfect Cookie Recipe addition to your Christmas Baking List. 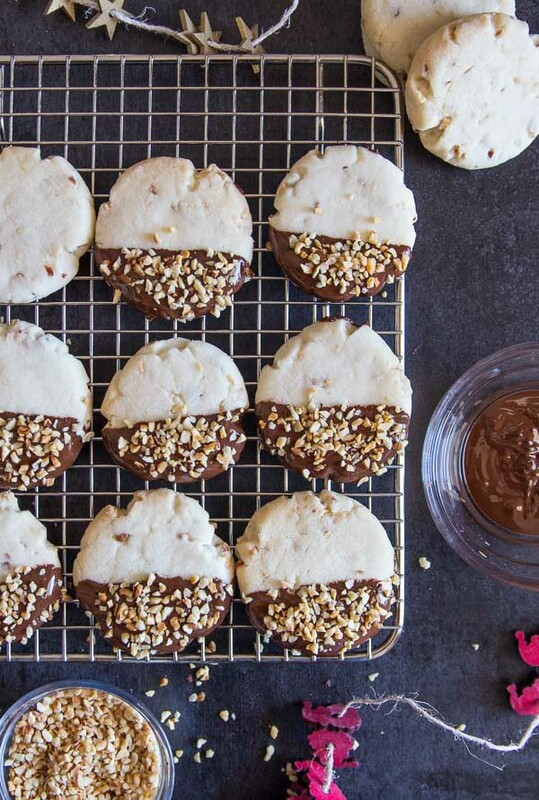 Chocolate Hazelnut Shortbread Cookies, these will be gone in minutes. Dipping them in Chocolate and a little sprinkle of ground nuts makes them the Best Holiday Cookie. Now that Halloween is over we can start getting into the heavy-duty stuff and by that I mean Christmas Cookies. From a simple Shortbread to a Hello Dolly and don’t forget the perfect Delicious Bar. Don’t you just love cookies? Especially Christmas Cookies. With all that Chocolate and Caramel, from simple cut out cookies to a little more gooey and decadent Bar Cookie. Something for everyone. More Delicious Christmas Cookies to Bake. 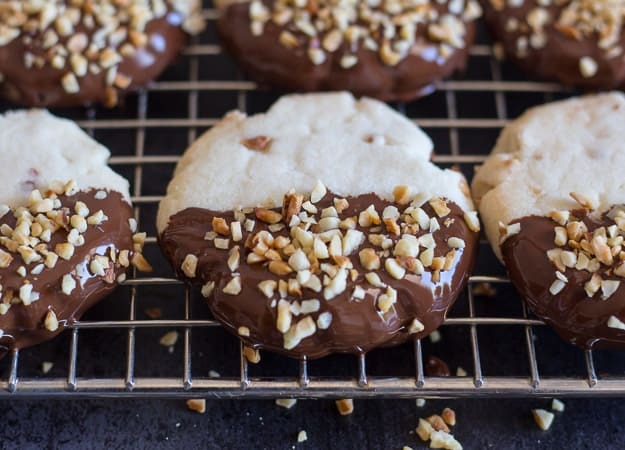 Well I do and one of my favourites are these Chocolate Hazelnut Shortbread Cookies. Before you ask, yes these were another of my Mom’s amazing Christmas Cookies. She would usually make them plain but I decided to dress them up a bit. I dipped them in some chocolate, either milk or dark works well, you decide. Then I sprinkled some more ground hazelnuts on top of the dipped chocolate. So delicious! Simple and plain they are the perfect melt-in-your-mouth shortbread cookie, fancied up and they are a delicious rich cookie dessert. When I make these Chocolate Hazelnut Shortbread Cookies, I like to make them on the thicker side, place them in the fridge for about 30 minutes, I find they are easier to dip or spread with the chocolate. They also freeze really well. You could probably freeze them plain and then dip and sprinkle before serving. This is one cookie everyone will love. Enjoy! 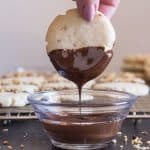 Chocolate Hazelnut Shortbread Cookies, a simple, easy melt in your mouth Christmas shortbread cookie, perfect plain or dipped in chocolate.Depending on size of cookie, makes approximately 3-4 dozen cookies. **if using unsalted butter than add 1/2 teaspoon salt. In a large bowl cream butter, then slowly add sugar and vanilla and beat, then slowly add the flour mixture and beat, stir in ground hazelnuts. 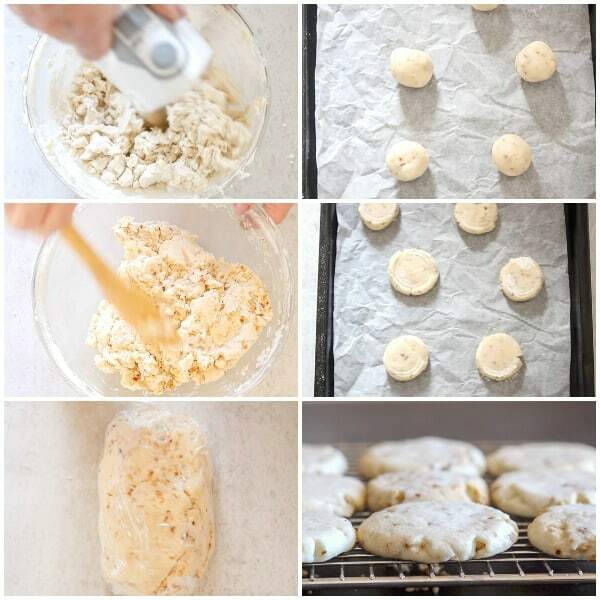 Refrigerate for approximately 30 minutes. 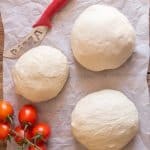 Remove from fridge and form small balls, place on parchment paper lined cookie sheets, lightly flatten with the bottom of a glass (lightly floured so dough doesn't stick)**. Bake for approximately 10-12 minutes or until lightly golden. Cool on wire racks. Refrigerate for approximately 30 minutes if dipping in chocolate. If not can be frozen or eaten at this point. Or frozen and dipped in chocolate later. 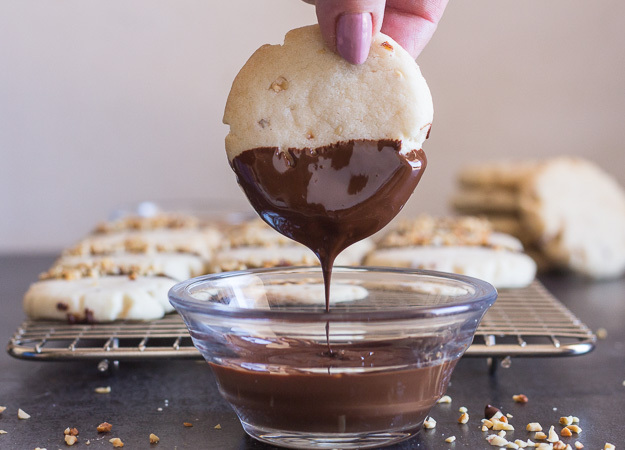 Melt chocolate and either dip half of the cookie or spread half of cookie with chocolate (I spread the top half of the cookie), sprinkle with ground hazelnuts. 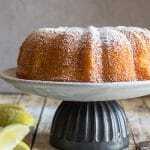 If you prefer plain then you could also sprinkle with powdered sugar before serving. Enjoy! **Make balls a little larger and flatten to a thicker size, if you want thicker cookies. Republished from November 2, 2015. Hi. The recipe says 1/2 c – 2/3 c ground hazelnuts walnuts. I assume you meant either hazelnuts or walnuts but is it 1/2 c or 2/3 of a cup? Hi Marua, yes I meant either, and it depends how many cookies you decide to dip with chocolate and sprinkle, I didn’t sprinkle all of mine, so I used half a cup. Hope that helps. Not counting the ground (chopped) nuts you decorate the outside of the cookie with, what is the measurement of ground walnuts you put in the dough? It’s a little unclear to me. It says 1/2 – 2/3. 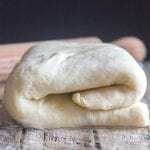 What is the measurement of ground walnuts you put in the dough? Hi Lisa, you can add a 1/2 cup or 2/3 cup depending how much you like nuts. I usually add 1/2 a cup. Hope that helps. How many cookies does this recipe make? Couldn’t find the amount. Hi Jane it’s actually listed just above the ingredients, you should get approximately 35-40 cookies depending on the size. Have a great weekend. Hi Rosemary. I love your recipes for shortbread cookies. 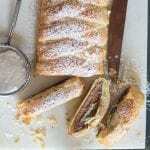 For this particular recipe can I use Almond nuts? would it work? Excellent recipe! Huge hit with the family! Hi Laura, thank you so glad everyone enjoyed them. Have a wonderful Christmas. Hi Malia, so glad you like them. Have a wonderful Christmas. These were nice but came out quite chewy, rather than what I expected from a shortbread. Did I overwork it or something, or is this how they’re supposed to be? Thanks for the recipe! Hi Kathryn, I don’t know why they came out chewy, did you maybe add too much flour? Have a very Merry Christmas. Hiii, can I just roll out the dough and then cut shapes out of it or do I need to form the balls to not overwork the dough? Thank you in advance! Hi Anjalie, instead of rolling it out why don’t you pat it out with the palm of your hand and then cut out shapes, I have never done shapes so not sure how much it would spread, but you never know unless you try, let me know how it worked. (you could always do a part of the dough and see). Have a great Sunday. what is icing sugar? like powdered sugar? Hi Amanda, yes icing sugar and powdered sugar are the same thing :). My batter was very crumbly when I refrigerated it. Not really sure what I did wrong? Any thoughts? I’m so bummed, they really looked delicious. I may give it another go. Hi Chrissy, it shouldn’t be crumbly, did you add too much flour or maybe you didnt give it enough time to come together. Let me know. hi! what type of chocolate do i have to use for this recipe? Hi Tef, I used dark chocolate but I think any chocolate would work, whichever you prefer, dark, milk even white. Hi Mariel, yes you can freeze the dough, I always double bag dough so it doesn’t get freezer burn.